Multi-platinum-selling country entertainer Sara Evans is returning again this year for another holiday season of her popular, limited-engagement “At Christmas Tour”, with festive shows created to get fans of all ages into the spirit of the season. Tickets are available starting Friday, August 31st at SaraEvans.com. Special guests, California country trio Fairground Saints, will open all shows of the holiday tour. Fans can also celebrate Christmas with Sara after the show! With the ‘At Christmas’ Sara Evans Meet & Greet Experience, you’ll get to meet Sara after the show and take home exclusive merchandise, all with a premium ticket to the show. “At Christmas”, released in 2014, is Sara’s first full-length Christmas recording. The 10-song collection features well-known holiday classics including “Silent Night,” “Winter Wonderland,” “I’ll Be Home For Christmas” and “O Come All Ye Faithful” plus the seasonal original song and title track, written by Shane Stevens and Toby Lightman. Evans released her eighth studio album, “Words”, in 2017 and it quickly shot to #1 on the iTunes Country Albums Chart. The 14-song project, released on her own Born To Fly Records, has been dubbed the album of her lifetime and “captures an artist in full musical flight” (Associated Press). 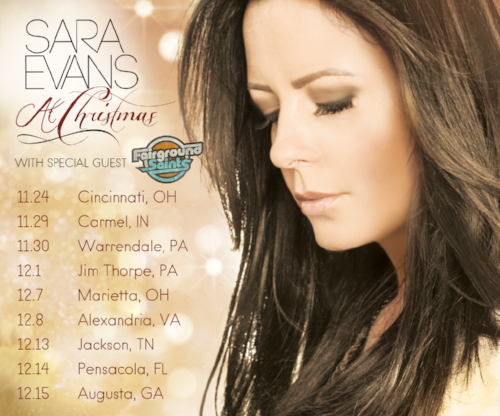 Learn more at https://www.cidentertainment.com/events/sara-evans-christmas-tour/ and check out Sara’s full list of tour dates HERE.